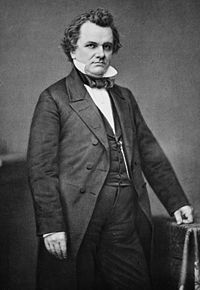 Stephen Arnold Douglas nicknamed the "Little Giant" (April 23, 1813 – June 3, 1861) was an American politician from the western state of Illinois, and was the Democratic Party nominee for president in 1860. He lost to Republican Party candidate Abraham Lincoln, also from Illinois. As a resourceful party leader, and an adroit, ready, skillful tactician in debate and passage of legislation, he has had few equals in American history. As chairman of the Committee on Territories, Douglas dominated the Senate in the 1850s. He was largely responsible for the Compromise of 1850 that apparently settled slavery issues. However in 1854 he reopened the slavery question by the highly controversial Kansas-Nebraska Act that allowed the people of the new territories to decide for themselves whether or not to have slavery (which had been prohibited by earlier compromises). The protest movement against this became the Republican Party. Douglas supported the Dred Scott Supreme Court decision of 1857, and denied that it was part of a Southern plot to introduce slavery in the Northern states; but also argued it could not be effective when the people of a territory declined to pass laws supporting it. When President Buchanan and his Southern allies attempted to pass a Federal slave code to support slavery even against the wishes of the people of Kansas, he battled and defeated this movement as undemocratic. This caused the split in the Democratic Party in 1860, as Douglas won the nomination but a breakaway southern faction nominated their own candidate. Douglas deeply believed in democracy, arguing the will of the people should always be decisive. When war came in April 1861, he rallied his supporters to the Union with all his energies, but he died a few weeks later. A Yankee born in Brandon, Vermont, Douglas came to Illinois in 1833 at age 20, was an itinerant teacher, studied law, and settled in Jacksonville. By the end of the year, he told his Vermont relatives, "I have become a Western man, have imbibed Western feelings principles and interests and have selected Illinois as the favorite place of my adoption." Within a decade, he was elected to the state legislature, and was appointed register of the Springfield Land Office, Illinois Secretary of State, and an associate justice of the Illinois Supreme Court in 1841, at age 27. A leader of the majority Democratic Party, he was elected twice to Congress (1842 and 1844), where he championed expansion and supported the Mexican-American War. Elected by the legislature to the Senate in 1847, he was reelected in 1853 and 1859. He contested the 1858 legislative elections by going head to head with Abraham Lincoln in a series of famous debates that received national attention. Henry Clay chiefly designed the Compromise of 1850, but the omnibus bill containing it did not pass Congress. Each point separately had majority support, but Northerners and Southerners combined to vote the bill down for their own reasons. Douglas passed the compromise by dividing it into separate bills, and arranged a different majority for each. He moved to Chicago, gaining wealth by marriage to a Mississippi woman who inherited a slave plantation. An avid promoter of westward expansion, he devised the land grant system that enabled the funding of the Illinois Central Railroad. Douglas always had a deep and abiding faith in democracy. "Let the people rule!" was his cry, and he insisted that the people locally could and should make the decisions about slavery, rather than the national government. He was passed over for the Democratic presidential nomination in 1852 and 1856. Douglas was conspicuously short (at 5 feet, 4 inches and weighing only 90 pounds) but his large head and massive chest and shoulders gave him the popular sobriquet "The Little Giant." Though his voice was strong and carried far, he had little grace of delivery, and his gestures were often violent. Douglas moved to a farm near Clifton Springs, New York and studied at Canandaigua Academy in 1832-1833. He then moved to Illinois as an itinerant teacher and soon rose in Democratic Party politics. 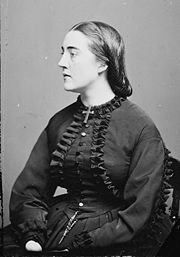 Douglas briefly courted Mary Todd (who married Abraham Lincoln instead). He married Martha Martin in March 1847, the daughter of wealthy Colonel Robert Martin of North Carolina. She brought to Douglas the new responsibility of a large cotton plantation in Lawrence County, Mississippi worked by slaves. To Douglas, an Illinois senator with presidential aspirations, the management of a Southern plantation with slave labor presented a difficult situation. However, Douglas sought to escape slave holding charges by employing a manager for his Mississippi holdings, while using the economic benefits derived from the property to advance his political career. His sole lengthy visit to Mississippi came in 1848, with only brief emergency trips thereafter. The newlyweds moved their Illinois home to fast-growing Chicago in the summer of 1847. Martha Douglas died January 19, 1853, leaving the senator with two small sons (one of whom was Robert M. Douglas). On November 20, 1856, he married 20-year-old Adele Cutts, the daughter of James Madison Cutts and a great-niece of Dolley Madison. An 1856 cartoon depicts a giant free soiler being held down by James Buchanan and Lewis Cass standing on the Democratic platform marked "Kansas," "Cuba" and "Central America." 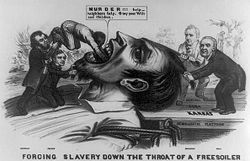 Franklin Pierce also holds down the giant's beard as Douglas shoves a black man down his throat. Douglas set off a tremendous political upheaval by proposing the Kansas-Nebraska Act in 1854. New laws were needed to allow for the settlement of the Nebraska territory. Douglas had invested in Chicago land, which would be made more valuable by railroads from Chicago that would serve the region; as it had been by the Illinois Central. The Compromise of 1820 had guaranteed slavery would not exist there (because it was north of the 36° 30' compromise line); and the Compromise of 1850 had reaffirmed this. Leading Southern Senators had met with Douglas, and had insisted on popular sovereignty as a condition for their support of the bill; and Douglas's first bill had only enacted it to a limited extent, by providing that Nebraska and Kansas could enter the Union free or slave as the residents might decide; but the Southerners insisted, and Douglas discovered a "clerical error," and revised the bill. Douglas argued that the people of the territory should decide the slavery question by themselves, and that soil and climate made the territory unsuitable for plantations; which last reassured his northern supporters it would remain free. Douglas defended his doctrine of popular sovereignty as a means of promoting democracy and removing the slavery issue from national politics, lest it threaten to rip the nation apart, but it had exactly the opposite effect. The act was passed by Southern votes, Democratic and Whig alike, and Douglas had little to do with the final text. This was the first appearance of the Solid South, and the opponents of the Act saw it as the triumph of the hated slave power and formed the Republican Party to stop it. 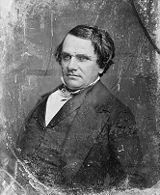 In 1852 and again in 1856, Douglas was a candidate for the presidential nomination in the national Democratic convention, and though on both occasions he was unsuccessful, he received strong support. When the Know Nothing Party movement grew strong he crusaded against it, but hoped it would split the opposition. In 1858 he won significant support in many former Know-Nothing strongholds. In 1857 he broke with President Buchanan and the "administration" Democrats and lost much of his support in the southern states, but partially restored himself to favor in the North, and especially in Illinois, by his vigorous opposition to the method of voting on the Lecompton Constitution, which he saw as fraudulent, and (in 1858) to the admission of Kansas into the Union under this constitution. In 1858 when the United States Supreme Court, after the vote of Kansas against the Lecompton Constitution, had decided that Kansas was a "slave" territory, thus quashing Douglas’s theory of "popular sovereignty," he engaged in Illinois in a close and very exciting contest for the Senate seat with Abraham Lincoln, the Republican candidate, whom he met in a series of seven famous debates which became known as the Lincoln-Douglas debates. In the second of the debates, Douglas was led to declare that any territory, by "unfriendly legislation," could exclude slavery, no matter what the action of the Supreme Court. Having already lost the support of a large element of his party in the South, his association with this famous Freeport Doctrine made it anathema to many southerners, including Jefferson Davis, who would have otherwise supported it. 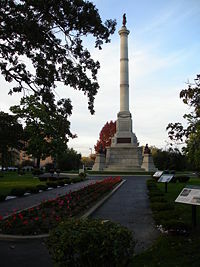 Before and during the debates, Douglas repeatedly invoked racist rhetoric, claiming Lincoln was for black equality and saying at Galesburg that the authors of the United States Declaration of Independence did not intend to include blacks. Lincoln pointedly denied Douglas' assertion that the Declaration of Independence did not include minorities. Much of the debate was about the redefinition of republicanism. Lincoln advocated equality of opportunity, arguing that individuals and society advanced together. Douglas, on the other hand, embraced a democratic doctrine that emphasized equality of all citizens (only whites were citizens), in which individual merit and social mobility was not a main goal. Douglas won the senatorship by a vote in the legislature of 54 to 46, but the debates helped boost Lincoln into the presidency. Douglas waged a furious battle with President James Buchanan for control of the Democratic Party. Although Douglas was not reappointed chairman of the Senate committee on territories, he bested Buchanan throughout the North and headed into 1860 as the front running candidate for president. In the 1860 Democratic National Convention in Charleston, South Carolina, the failure to adopt a slave code to the territories in the platform brought about the withdrawal from the convention of delegations. These included Alabama, Mississippi, Louisiana, South Carolina, Florida, Texas and Arkansas. The convention adjourned to Baltimore, Maryland, where the Virginia, North Carolina, Tennessee, Kentucky and Maryland delegations left it, and where Douglas was nominated for the presidency by the Northern Democrats. He campaigned vigorously but hopelessly, boldly attacking disunion and in the election, though he received a popular vote of 1,376,957 (second at 29 percent) he received an electoral vote of only 12 (fourth and last at four percent) with Lincoln receiving 180. His support in the North came from the Irish Catholics and the poorer farmers; in the South the Irish Catholics were his main supporters. Douglas urged the South to acquiesce to Lincoln's election; and made efforts to arrange a compromise which would persuade the South to remain in the Union. As late as Christmas 1860, he wrote Alexander H. Stephens, offering to annex Mexico as a slave state as a sweetener; Mexico had abolished slavery in 1829. At the outbreak of the American Civil War, he denounced secession as criminal, and was one of the strongest advocates of maintaining the integrity of the Union at all costs. At Lincoln's request he undertook a mission to the border states and to the Midwest to rouse the spirit of Unionism; he spoke in West Virginia, Ohio and Illinois. Douglas died from typhoid fever on June 3, 1861 in Chicago, where he was buried on the shore of Lake Michigan. The site was afterwards bought by the state, and an imposing monument with a statue by Leonard Volk now stands over his grave. Today, there are Douglas counties in Colorado, Georgia, Illinois, Kansas, Minnesota, Nebraska, Nevada, Oregon, South Dakota, Washington and Wisconsin. The city of Douglas, Georgia is also named for him, but it is not located in his namesake county; the city of Douglas is found in Coffee County. The county seat of Georgia's Douglas County is, fittingly, Douglasville. History of "Stephen A. Douglas"
This page was last modified on 21 October 2015, at 16:01.